Michael Jennings is a reverse engineer and what he does is technical jobs for certain companies and as soon as he is done, his memory of the work he has done is wiped out. Now the longest he has been contracted is 2 months. But now billionaire, James Rethrick offers him a job that would last 2 years, maybe 3, and he promises that he will probably earn 8 figures. Michael agrees. Before beginning he turns in all of his personal effects. And when the job is done, his memory is erased and he learns he made over 90 million dollars over the three years. When he goes to claim it and his personal effects, he discovers that prior to the erasure of his memory he waived his rights to the money he earned and that the items that were given to him were not the ones he gave when he began. Later he is arrested by the FBI who say that he committed some act of treason and murder. It's while he is in custody that he escapes using some the items that he was given. He later meets with a friend who gives him some information that helps him understand what is going on. And at the same time Rethrick for some reason wants him so he is being pursued by Rethrick's people. Jennings is the best reverse-engineer in the business. He is hired by clients to take apart other companies technologies and find out how they work. He is hired to do a special job, against the advice of some of his associates. When the job is completed, all memory of what he has been working on is erased from his mind. That's when his problem really start to begin. He is hunted for something he has no recollection of doing and has only a little time to work it out. He has sent himself 19 seemingly unconnected objects, before his memory was wiped, to allow him to put the puzzle together and discover just what has gone on and what he has done. But the authorities are after him and time is very quickly running out. If you ever played (and liked) Monkey Island, LLL or Space Quest you'll like this movie. However, a last job will do it. A big one. He finishes the job and then go to check out to fetch his personal belongings (which was left there before the job). The bag contains 20 items and he has to figure out the purpose of each item. Just like "try everything with everything" in the mentioned computer games. A short introduction with many holes, which you can fill by watching the movie. * Although the setting is 21-century America, it is a more dystopian future. A recent change in government has been referred to, the new government has a secret police force that supposedly never releases its detainees, the new government uses "credits" instead of "dollars", and individual citizens have significantly fewer rights than corporations do. * Rethrick is a much older man and has no prior connection with Jennings. * Although there is a potential love interest who works for the company named Kelly, she does not encounter Jennings until after the memory wipe and has a "surprise ending" secret that is not in the movie. * Technology is significantly different. Erasing memory is a secret that most people do not know about (including the goverment agents who arrest Jennings). Rethrick's company still has significant manual labor. Cameras still require mechanical film. Rockets that transport people between cities are commonplace. And, the device that Jennings develops for Rethrick not only sees things but can also retrieve things. * The plot features a lot more blackmail and threat of blackmail. Rethrick is generally unaware of Jennings' experiences after the memory wipe and it is Jennings who is looking for Rethrick, not the other way around. * The climax of the short story is completely different from that of the movie. In the story, Jennings sneaks into the company alone, rather than with a partner as in the film (in the story he enlists Kelly's help, but simply asks her to keep whatever he finds safe so that it doesn't fall into the hands of the authorities) using a piece of cloth among his belongings that identifies him as a worker. He also had no interest in destroying the machine (identified as a "time scoop"), he simply wanted to photograph it (the device itself was illegal and the company was part of a resistance against an oppressive government). The film also adds in a climatic shootout that destroys most of the building, while in the original short story Jennings merely snuck out through a back door he had left himself a key to. 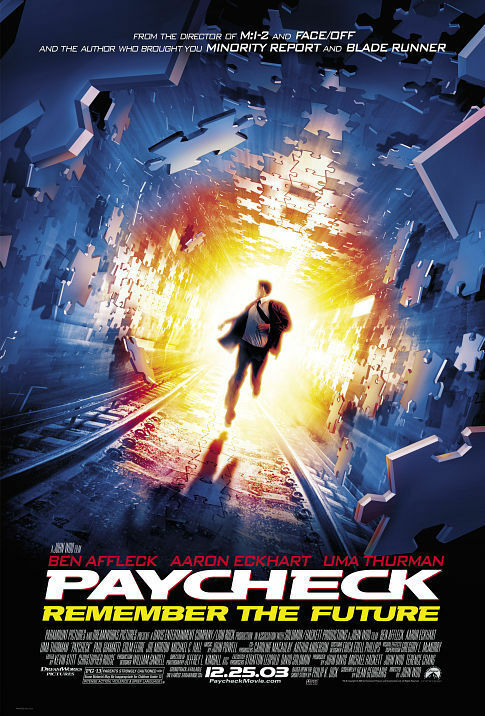 * The movie ends with Rethrick being killed while Jennings escapes and goes on to live with Rachel; the short story ends with Jennings successfully blackmailing Rethrick into making him a partner in the corporation, hinting at the possibility that he may eventually find a way to take over.